Probably no substantial dimension of film history has been so thoroughly ignored by American film critics, historians, and theorists as the nature film (or “wildlife film”): those works of cinema that purport to reveal the lives of other species. This lack of scholarly attention seems to have resulted from the mistaken assumption that nature filmmakers do not reveal any philosophical or cinematic vision in their work, that nature films merely present facts. In recent years, a few books have begun to correct this misconception, including Gregg Mitman’s Reel Nature: America’s Romance with Wild­life on Film, Derek Bousé’s Wildlife Films, Cynthia Chris’s Watching Wildlife, and Science Is Fiction: The Films of Jean Painlevé, edited by Andy Masaki Bellows and Marina McDougall, with Birgitte Berg. But these are the exceptions that prove the rule, and we have a long way to go before the accomplishments of this aspect of cinema history are appreciated and understood. In coming to terms with the immense world of nature cinema, a very good place to begin, as Science Is Fiction makes clear, is with French scientist-educator-filmmaker Jean Painlevé, whose groundbreaking work consistently revealed not only a commitment to informed science and effective communication but to the creative expression of ideas as well. Born in 1902 to the prominent mathematician and statesman Paul Painlevé and Marguerite Petit de Villeneuve, who died in childbirth, young Painlevé was brought up by his paternal aunt and followed a normal, if rather precocious, path to a scientific career. In 1923, he and Dr. Maurice Parat coauthored a paper on chironomid larvae, and Painlevé became one of the youngest researchers ever to deliver a paper to the Académie des sciences. In 1924, he graduated from the Sorbonne with a degree in physics, chemistry, and biology, and quickly began to forge what would become a unique, six-decade-long career, during which he continuously sought to demonstrate the value of cinema for science. This was a highly controversial idea among certain French scientists in 1928, when Painlevé screened The Stickleback’s Egg: From Fertilization to Hatching (1925) at the Académie des sciences. 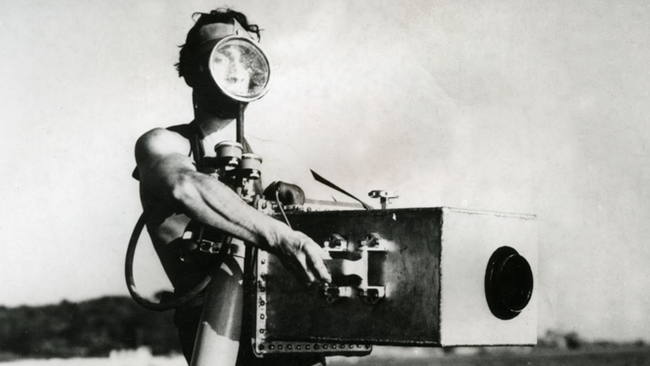 Some in the audience were outraged—cinema, they said, was not to be taken seriously!—but Painlevé persisted and became a pioneer in both science and filmmaking. While he was committed to his academic work, Painlevé’s influences ranged far beyond the classroom and the laboratory. When he felt ostracized by his politically conservative fellow students at the special schools he attended, he regularly escaped to the Left Bank’s Saint-Michel theater, where he enjoyed the films of Mack Sennett, Georges Méliès, and Émile Cohl, and to the Jardin des Plantes, where he helped the keeper look after animals. During the 1920s, he became involved with Dadaist and surrealist art and with the avant-garde film scene that was thriving in Paris. When Man Ray needed starfish footage for his L’étoile de mer (1928), Painlevé provided it. In 1924, he collaborated with Guillaume Apollinaire and others on the inaugural (and final!) issue of Surréalisme, to which he contributed “Neozoological Drama,” a satiric scientific description of an interaction between sea organisms that reads like a surreal melodrama. And the wacky funeral in Painlevé’s Methuselah (1927) is led by a bishop played by Antonin Artaud; the funeral itself is reminiscent of René Clair’s Entr’acte (1924). Painlevé’s interest in the aesthetic aggressiveness of Dadaism and surrealism continued long after his reputation as a nature filmmaker had been established and found vent not only in his nature films but in the remarkable narration he wrote for Georges Franju’s Blood of the Beasts (1949). The Painlevé films exemplify nature cinema at its best: producing them required both an intense engagement with the biology of particular species and the development of technological means for effectively recording and communicating information about those species. By the early 1930s, Painlevé had developed a method for filming the aquatic life forms that fascinated him, and was making both research films and films aimed at general audiences. The large body of research works, directed and/or produced from 1925 until the mid-1970s, is represented in this collection by The Stickleback’s Egg and Experimental Treatment of a Hemorrhage in a Dog (1930). The other films on these DVDs reveal the breadth of his popular works, and the continuities among them, though Painlevé’s reputation seems sure to rest on his remarkable investigations of sea creatures. These are so inventive that they continue to attract general audiences, including the popular music group Yo La Tengo, which regularly performs with the films. Painlevé’s commitment to using film in the interests of science also produced many essays on the practice and theory of filmmaking, including his “Ten Commandments” for filmmakers. His second commandment is “You will refuse to direct a film if your convictions are not expressed.” One might wonder how scientifically informed nature films can be said to express convictions, but it is precisely Painlevé’s implicit (and sometimes explicit) reasons for selecting the organisms he does and his manner of presenting them that reveal his attitudes. Each Painlevé nature film tends to focus on a single organism, presenting, clearly and concisely, the crucial moments in its life cycle. In general, Painlevé’s commitment is to reveal the wonder and the beauty of organisms that some would consider beneath our notice (the sea urchin, for instance, or the Acera, a tiny mollusk). And he is particularly drawn to organisms, and aspects of organisms, that some would find disgusting: the South American vampire bat in The Vampire (1945), for example, and the octopus—“cephalopod, horrifying animal”—in The Love Life of the Octopus (1967), a project that took ten years to complete. Painlevé’s choices often seem, at least in part, a function of the ways in which particular organisms offer a challenge to conventional societal assumptions and values. For example, in an unpublished conversation with Birgitte Berg, Painlevé makes clear that one of the reasons for his early choice of the sea horse as subject was the way the male and female collaborate on child birthing: the abdomen of the male sea horse has a pouch into which the female lays her eggs; once the eggs are fertilized, the male nourishes them and, in time, gives birth to the baby sea horses in a manner reminiscent of female human labor. As Painlevé explains to Berg: “The sea horse was for me a splendid way of promoting the kindness and virtue of the father, while at the same time underlining the necessity of the mother. In other words, I wanted to reestablish the balance between male and female.” Rather than use the sea horses to confirm conventional middle-class family patterns, the way the Disney True Life Adventures series tends to do, Painlevé uses his cinematic investigation of sea horses to do what he sees as progressive gender politics. He wants us to learn not only about but from this strange fish. This interest in confronting conventional gender assumptions is evident in several of his works. Daphnia (1928) focuses on tiny female organ­isms that reproduce themselves without fertilization; Sea Ballerinas (1956) examines starfish, some species of which are simultaneously male and female; How Some Jellyfish Are Born (1960) focuses on colonies of jellyfish that are either male or female and, in both cases, fertilize themselves. And Acera, or The Witches’ Dance (1972), among Painlevé’s most remarkable films, seems to have two motivations. Of obvious interest is the Acera’s way of finding a mate. As suggested in the film’s title, Acera do a kind of ballet during which the cloaks that encircle their bodies fly open, evoking tutus. A substantial portion of the film is devoted to shots of this dance, which is fascinating and lovely—and reminiscent of moments from Oskar Fischinger films and from Disney’s Fantasia. But once the Acera have found mates, we learn that each is bisexual and can function sexually as either male or female, or, as is demonstrated in the film, simultaneously as male and female. In one instance, Painlevé reveals a chain of five Acera: each of the three middle partners in the sexual act is fertilizing the eggs of one Acera and, at the same time, having its own eggs fertilized by another. One can only imagine the repercussions if this lovely film were shown in high school biology classes in the United States today! It was the particular advantages of cinema that, to a large extent, attracted Painlevé to this means of scientific expression. He was consistently enthusiastic about cinema’s ability to transform microscopy from a solitary undertaking to an experience an audience could share. In the early films Daphnia and Sea Urchins (1928), he indicates that some of what we see is magnified many thousands of times. In a later film about sea urchins, also called Sea Urchins (1954), Painlevé’s magnification transforms tiny spines into stately “temple columns.” Painlevé also makes frequent use of film’s ability to condense and expand duration. In The Love Life of the Octopus, for example, we can see the development of an octopus egg through stages of torsion, then rotation, as a result of the camera’s ability to accelerate motion by fourteen hundred times; and in How Some Jellyfish Are Born, an acceleration of up to a thousand times allows us to witness occurrences that would otherwise remain invisible. On the other hand, it was “thanks to slow motion” and to cinema’s ability to show imagery in forward and reverse that Painlevé could produce his homage to Étienne-Jules Marey, “the creator of scientific films,” in Pigeons in the Square (1982). So long as the requirements of good science were met, Painlevé felt quite free to work with sound and image in imaginative ways. His use of Duke Ellington’s “Black and Tan Fantasy” and “Echoes of the Jungle” in The Vampire and a range of jazz in Freshwater Assassins (1947) gives these strange, often creepy films a humorously macabre ambiance. In other instances, classical music helps to demonstrate the elegance of particular creatures. In Hyas and Stenorhynchus (1927), Maurice Jaubert orchestrates Chopin to reveal the grace of the Hyas as compared with the clumsy Stenorhynchus; in Caprella and Pantopoda (1930), Jaubert orchestrates Scarlatti to accompany a danse macabre by a group of spider crabs; and in the 1954 Sea Urchins, Painlevé employs “organized noise”—a group of young people playing pots and pans—“as a tribute to my friend Edgar Varèse.” The narrations of the Painlevé films are usually evocative, and often amusing. When asked how he achieved the strange, breathy narration for The Love Life of the Octopus, Painlevé explained that the narrator “was an old man who, out of vanity, refused to wear glasses. He was therefore obliged to stick his face right up against the script, close to the microphone, and one could hear his emphysema”—perfectly appropriate for this particular film. Painlevé often attempted to make science entertaining by including imagery that went beyond a rigid scientific focus. Near the conclusion of The Sea Horse (1933), as we watch several sea horses move, Painlevé puns on “horses” by inserting a shot of a horse race. The Vampire begins with a general introduction to the history of vampires in Western culture, including an image of Nosferatu from the 1922 Murnau film. And in both Hyas and Stenorhynchus and Acera, or The Witches’ Dance, Painlevé includes references to the famous French dancer Loïe Fuller: the former includes what Painlevé calls “a Loïe Fuller ballet,” and in the latter, a long passage of the creatures dancing includes an insert of dancer Michèle Nadal imitating Fuller—a way not only of emphasizing the beauty of the Acera’s movements but of reminding us that animals dance for much the same reason we do: to communicate with potential mates. Painlevé died in 1989, at the age of eighty-six, having produced more than two hundred films, countless photographs, and a considerable body of writing. Throughout his remarkable career, Painlevé’s primary commitment was to support the creation of first-rate nature films and the development of popular audiences for these and other forms of cinema that might function to inform and energize the public. Soon after World War II, Painlevé became president of the French Federation of Ciné-Clubs, and he continued to promote the use of cinema as a way of popularizing science through his work with the Institute of Scientific Cinema, which he had founded in 1930, and by helping to establish the International Association of Science Films, which held conferences where science films from around the world were screened. He was also one of the first nature filmmakers to work with television, and in time would experiment with new video techniques. While for Disney the nature film was one small part in the construction of an empire, for Painlevé filmmaking was an intensely personal and life-defining means of democratizing scientific research and sharing information and ideas about our remarkably complex, sometimes terrifying, but always wondrous planet. Scott Macdonald is the author of the Critical Cinema series of interviews with independent filmmakers, now in five volumes, and The Garden in the Machine: A Field Guide to Independent Films About Place (2001); Adventures of Perception: Cinema as Exploration, which includes his article “Up Close and Political: Three Short Ruminations on Ideology in the Nature Film” (Film Quarterly, Spring 2006) and an interview with French nature filmmakers Claude Nuridsany and Marie Pérennou, is in production. He teaches at Hamilton College and Harvard University.